We don't limit ourselves to what can be done. The auto industry is growing extremely fast and we want to keep up. If you want to bring your classic car back to life, we can help. No job is too small or too large, we love what we do and like to see projects at the finish line. My car is too old & rusty. No problem! We can bead blast your parts as you go. If you need floor panel replacements, or just a patch, we can weld them in. Have a car not running that's been sitting for 10 years? We want to work on it. Call us and tell us your story and we'll figure out a way to put life back into your car. All the talk these days is turning your classic car into a modern ride with all the luxuries of a new car. We've done it and can help you too. 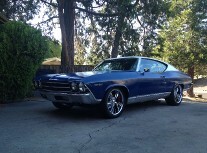 On the right is a picture of my personal 1969 Chevelle that underwent a LS1 & 4L65e transplant. We used a donor 2004 GTO and removed the drive train, wiring and PCM, power leather seats front and back, as well as the seat belt assembly. We added a Ricks Stainless Steel fuel injection gas tank, CPP pro-touring kit, 4 wheel disc brakes from Wilwood. A Vintage Air kit with AC and heater ,autometer gauges, orginal console, carbon fiber dash & steering wheel topped off the interior. The rearend has a new 3.90 Posi unit. We ended up with a true 375 horsepower, street pounding muscle car with the reliability of new cars on the road today. At Classic Restoration of California, we provide a unique service to personal car collectors. As we all know, life gets busy and sometimes we neglect our old cars. We want to help maintain those vehicles so you and your family can continue to enjoy them. Our specialized maintenance plans vary for each type of owner and car collection. We will meet with in you person and review your situation and needs. Then develop a maintenance plan that keeps your vehicles running. Depending on your individual situation we can help you keep those cars running for many years to come. Local service in Contra Costa County and some surrounding areas. Please don't hesitate to contact us with any questions or pricing concerns. 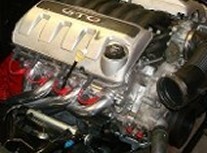 Contact us for an estimate on engine builds and upgrades from Classic Restoration of CA in Walnut Creek, California.